Focused on traditional buildings, which make up a quarter of the UK building stock, the National Trust and the Federation of Master Builders have teamed with the Environment Study Centre to deliver a national specialist training programme across England and Wales with funding from CITB. 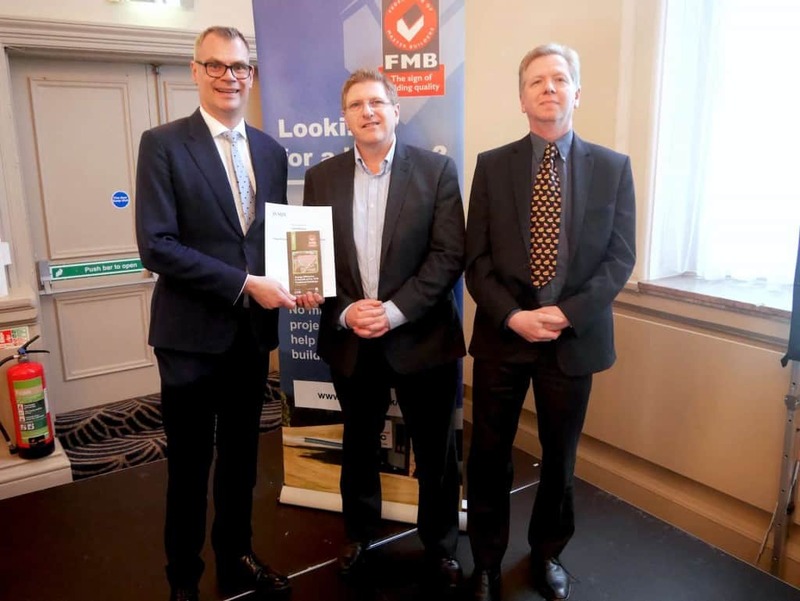 The programme was launched last month at the FMB’s national conference in Brighton by Brian Berry the Chief Executive of the FMB (left), Rory Cullen, Head of Buildings at the National Trust (right) and John Edwards of Edwards Hart Consultants (centre) who will deliver the training. The course was initially developed by CITB’s National Construction College and specialist building consultancy Edwards Hart but has been refreshed with the latest innovation and research by BRE, Historic England, STBA and others. Director of Edwards Hart, John Edwards said: “It is very common to treat traditional buildings as modern buildings with many unintended consequences”. This two-day course is the only course of its kind that delivers a qualification and is independently accredited by the Scottish Qualification Authority. The National Trust will also see many of their people train and get qualified. Head of Buildings at the National Trust Rory Cullen said: “The National Trust may have many fine country mansions but it also has thousands of small dwellings, many of which are not listed”. Rory added: “We would like to see as many of our people as possible take part in this training and believe that only by improving our knowledge, will we properly and safely improve our valuable buildings”. The course takes a holistic approach and identifies the many other ways in which buildings can be made more energy efficient and sustainable before contemplating retrofit. John Edwards added: “It’s a huge mistake to jump in and retrofit without first properly understanding the building and its condition and that’s the approach that this course takes”. The course is being offered as a subsidised rate due to funding from CITB. For more information and to book click here.